Nerdvark says "Definitely!" 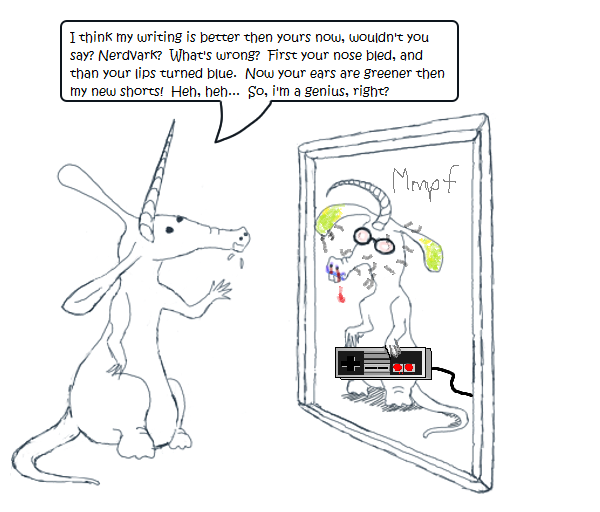 In addition, when Nardvark confuses them, it makes Nerdvark's ear-tips turn green. Then is an adverb of time. Use it to tell what order things happen in. Nerdvark read Nardvark's latest attempt at writing, and then when Nardvark said, "Great work, eh?" he laughed so hard he snorted milk through his nose. Nerdvark's horn is droopier than Nardvark's. Nerdvark's teeth are larger than Nardvark's, and they make him look like a rabbit, not a narwhal-aardvark cross. Nerdvark's vision is worse than Nardvark's, and he looks like a nerd in his hipster glasses. Need a mnemonic? than has the article an in it. Use it in the sentence "An ant is smaller than an elephant."